The ecological impact of rubber flooring is directly related to the type of rubber that is used. Understanding where it comes from, how it was manufactured, and how it got to your location is the only way you can truly know how green the material is. Synthetic Rubber Floors: This is the least Eco-friendly choice when it comes to rubber materials. Synthetic rubber is made from petroleum, a non-renewable resource. Despite this, the process used to manufacture this material is actually quite energy efficient and low impact. The draw of synthetic rubber is that these floors are more durable and longer lasting than natural rubber alternatives. While finite resources are consumed in their production this is balanced to some extent by the long life of the resulting product. In some cases, this effect can be boosted by recycling the rubber floor at the end of its life cycle. Natural Rubber Floors: This material is manufactured from latex, which is a sap found in para rubber trees, also known as Hevea brasiliensis. This same material is also found naturally in lettuce, dandelions, and in fig trees. Unfortunately, some people are allergic to latex, and the installation of such a floor can be harmful to their health. Transportation: Para rubber trees can be replanted each season making natural rubber an easily renewable resource. These trees are mainly grown in Southeast Asia, Africa, and the Amazon rainforest. Depending on where you live you may want to consider the environmental impact of transportation from the location of growth to your own. These are the most environmentally friendly rubber floors. Made from recycled rubber such as that found in old car tires, this material helps to eliminate the build up of waste making it a low impact floor covering choice. The process of manufacturing is low cost and requires less energy than is used in the creation of most other resilient floors. In many cases, it is also the least expensive rubber flooring option available. Recycled rubber is generally stronger and more durable than natural rubber flooring however it does come with a few caveats. Many manufacturers will not recommend its use in kitchens, laundry rooms, or garages, as it may be subject to staining from grease, petroleum, fats, and detergents. You should check with your retailer before deciding to use recycled rubber in a specific location. One of the biggest drawbacks to installing a rubber floor is that there is going to be a slight smell. Because of this many manufacturers do not recommend installing this material in an enclosed space without proper ventilation. In most cases, this smell is not harmful but it can make a poorly ventilated interior uncomfortable. You may also have to worry about those with latex allergies in the case of natural rubber, or the release of VOC's if adhesive was used in the installation. This doesn't necessarily have an impact on the world environment, but the sound insulation qualities of rubber flooring can make the personal environment of an interior more pleasant. This material is flammable and if there is a fire it will burn. This is another place where it is important to understand the chemical composition of the material. Its flammability will depend on the elements used in its manufacture. A rubber floor that contains chlorine or other toxic ingredients is going to release them into the air if it catches on fire. That is why an Ethylene propylene diene based material is recommended as a viable alternative to PVC based rubber products. By choosing loose lay or interlocking rubber floors that do not require adhesive you are eliminating the production and waste elimination of an extra chemical from the flooring process. If an adhesive is used to install a floor it also makes those materials unsuitable for recycling at the end of their life cycle. Some flooring adhesives contain chemicals that can give off gas Volatile Organic Chemicals (VOC's), causing a negative impact on the interior environment of a room when used. It is important to question your retailer and understand the properties of any adhesive which is used in the installation. Rubber flooring is a long lasting resilient flooring material that can often last for twenty years or more. This can significantly cut down on the cost of waste and replacement needed for less durable flooring materials. Tiles have a longer life span than sheet rubber flooring. This is because individual tiles can be replaced if damaged with less waste cost than removing and reinstalling an entire sheet floor. 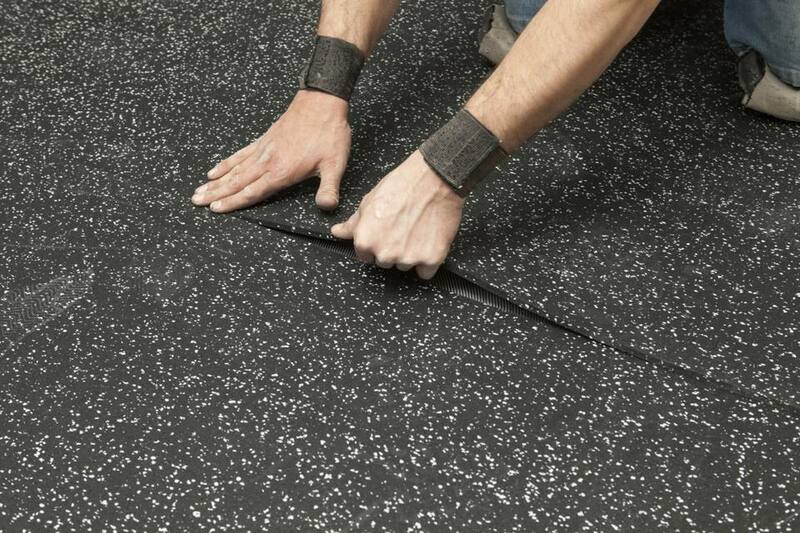 If adhesive was not used in its installation then most rubber flooring can be recycled and re purposed to other flooring when it is no longer needed in a single installation. This allows it to last far beyond its own natural life cycle keeping it from the landfill for years beyond its initial use.